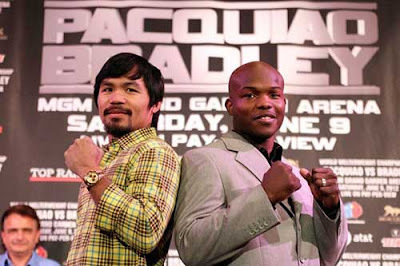 The much awaited fight this year is between pound for pound Filipino Champ Manny Pacquiao and the challenger Timothy Bradley this coming June 9, 2012 at the MGM Grand in Las Vegas. Manny Pacquiao will defend his World Boxing Organization (WBO) welterweight title. The 33-year-old Filipino boxer will do the same technique on his training at the summer capital part of the Philippines before he will go to the Wild Card gym in Los Angeles. We all know that the pound for pound Filipino boxer is considered one of the greatest fighters of all-time. He is the reigning WBO light-welterweight champion. After this coming Holy Week, the Sarangani province representative Manny Pacquiao said he will start getting in shape again. Comments or suggestions about "Manny Pacquiao vs Timothy Bradley Welterweight Fight" is important to us, you may share it by using the comment box below.